The uploader of this video blurred the face of the victim – using YouTube’s face blur tool – after WITNESS and others contacted him, asking him to protect the victim’s identity. The chilling taunt comes 4 minutes into a 20-minute Russian YouTube video of homophobic harassment that went viral last week. It is the most chilling reminder that as powerful a tool video can be for human rights advocates, it can be a weapon of abuse as well. "By circulating the video without protecting the anonymity of the victim, these distributors have become unwitting accomplices in the harassment." In this case, neo-Nazis stuck a camera in a teenager’s face like a dagger and used online video distribution as a threat, a means of torture that is bound to follow him the rest of his life. The tormentors warn that the video will be posted to VK.com, a Russian social media site, “eight times a day.” For a teenage boy in a country where homosexuality is increasingly criminalized, no knife cuts deeper than the weapon of a public outing through online video and social media. But by circulating the video without protecting the anonymity of the victim, these distributors have become unwitting accomplices in the harassment. (Note: After WITNESS pointed out the new version protecting the victim’s anonymity, Gawker switched out the video embedded on its site.) They are carrying out the crime that the abusers unleashed, outing a 15-year-old to more than a half-million viewers around the world. What will this mean for the boy, whose face is not only recognizable throughout Russia, but throughout the world? Once a video, tweet or photo goes viral, it’s tough to put the brakes on information that misinforms, or in this case, an image that violates the privacy of a vulnerable kid. But as activists, we cannot effectively fight against abuse if we fail to recognize the impact of our own advocacy on victims. Bearing this in mind, there are ways news outlets and advocates can avoid — or at least minimize — re-victimization, while still spreading awareness of critical issues. 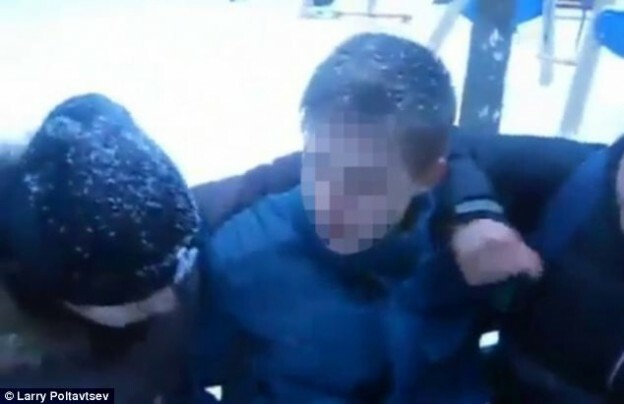 In its coverage of this video, England’s Daily Mail blurred the faces of victims in photos, and re-uploaded the video to its own video player using a face-blur tool. The YouTube face-blurring interface. Image from the YouTube blog. On YouTube, any uploader can enhance the visual anonymity of individuals by using YouTube’s face blur tool, designed specifically for cases like this. 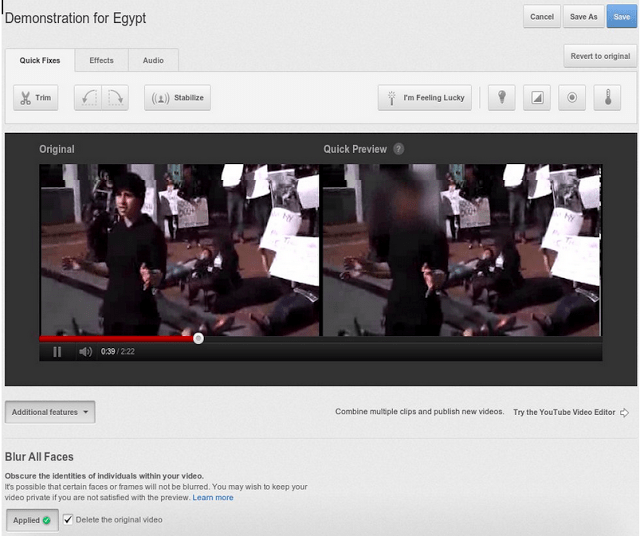 Simply click on Enhancements when you upload a video, and choose the blur option. That’s what the uploader of the video above did. Though his previous upload has already been circulated around the world, after WITNESS and other concerned organizations such as LGBT Guide informed him of the importance of visual anonymity, he re-uploaded the video to create the version above, protecting the victim’s identity. What’s the point, you might ask, when the victim’s identity has already been exposed to 600,000 people and counting? Damage has certainly been done. But as we work to bring homophobic violence to light, and to an end, we can begin by making a difference one video, and one victim, at a time. This story originally appeared on Witness.org’s blog. Witness.org’s blog is an ongoing conversation about the effective use of video in human rights campaigns to create policy, behavior or practice changes.